We invite you and your children to visit our school. Tours are generally scheduled on Thursdays and are conducted by veteran staff members, or quite often by the principal. If you are relocating to our area, please contact our school office at 205-824-7886, ext. 19 to arrange a tour at a time that best suits your travels. We realize moving to a new town can be challenging, and we are happy to accommodate your schedule. Prince of Peace is a welcoming environment. 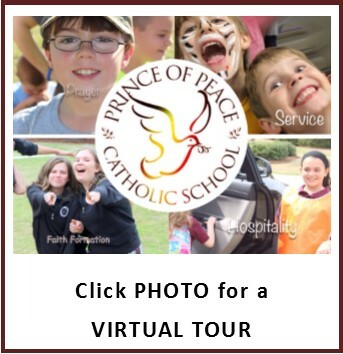 Students in upper elementary and especially middle school can benefit by spending a few hours with a Prince of Peace student, following a typical class schedule. Please let us know if shadowing is of interest to your child.